They have finally flowered and you can see they are attracting some wildlife too! The smell is divine and I am so glad I planted these beneath the apple trees in containers. These are a dwarf variety and are perfect for container growing. They are also at the right height for when you are sitting down at the patio for their scent to drift right over to you. 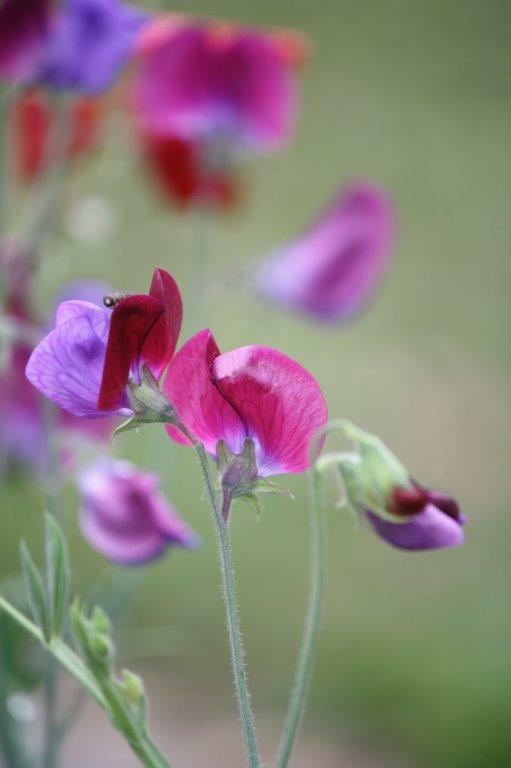 I love sweet peas and I think every garden should have them in some form. I’m currently making little posies for the house. Yes, the mighty dahlias are doing amazingly well for me. Despite losing 3 out of our 9 during the storm these are rewarding me with continuous enormous flower heads that bring the new back bed alive. I think I will be adding a few varieties next year. I wish I had labelled my containers better before planting because my toddlers have swapped a few of them around and now I’m losing my black dahlia in a dark corner where my white was supposed to go. I foresee some careful lifting and labelling ahead in my future! Okay, I don’t love this plant but it does look fantastic when it is in full bloom. 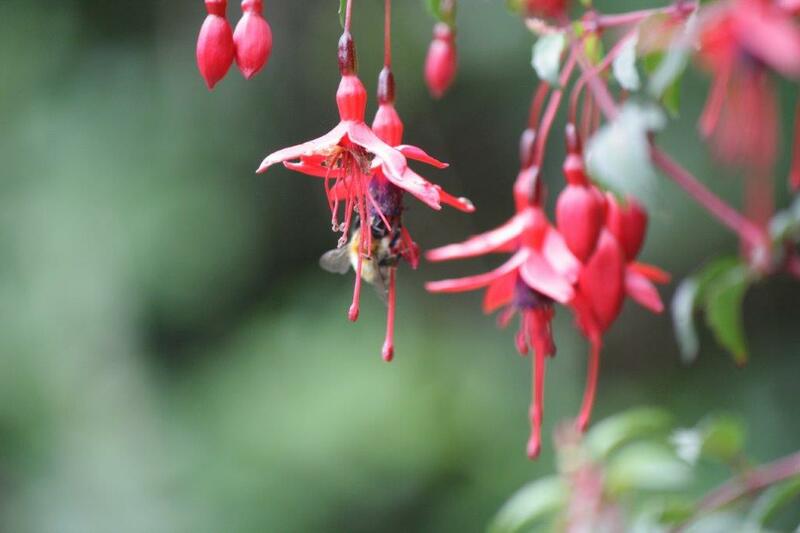 The bees absolutely love it and there are so many there that it sounds like the bush is humming. This is the overgrown beast that we severely cut back at the start of the season and it is thriving now. I marked some more branches for removal for next year so I think we may finally get a grrip on the pond area and get a little woodland type garden growing in that corner next year. I wish I knew the name of this one but it came with our house. 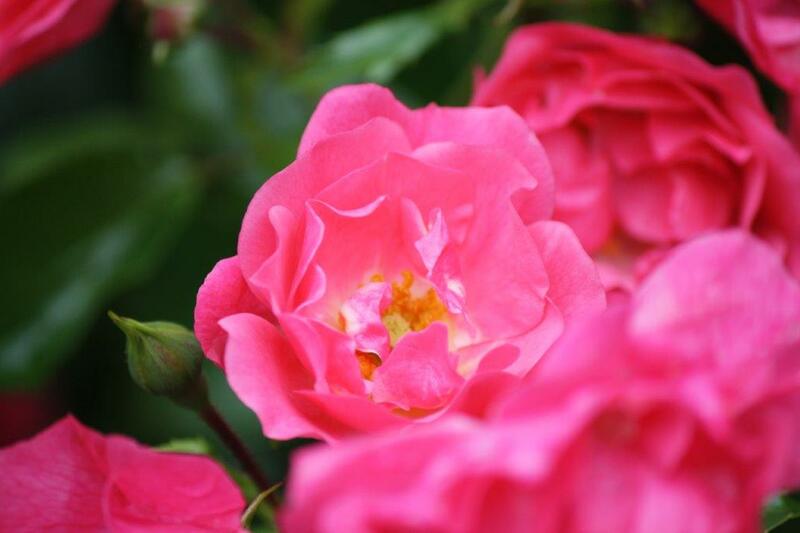 It is a magnificent floribunda rose with an open bloom that bees love and the smell is divine. It’s deep, heavy and lingers. It continuously blooms right up to and a little after the first heavy frost. In fact, it was still trying to bloom as I trimmed it back and shaped it in Jan/Feb. The plant needed a rest so I think it rather enjoyed being reduced to a few canes. You would never know it now because it is up to my shoulders and is a mass of flowers. This is a plant that I both equally love and loathe. While the smell is beautiful and it fills my garden with butterflies my 2 plants were inherited and both planted in positions that I wouldn’t have chosen. One was allowed to grow incredibly tall and into a tree which is possibly about 8 – 9ft high and as they don’t have a taproot, it makes me nervous during storms. They also appear to seed (?) with abandon as I have removed a huge number of mini plants from my garden over the last 5 years. It could be that they throw out suckers or sprout up from travelling roots I’m not quite sure how they do that and I never really looked into it further. If you know please let me know in the comments. These are coming to the end of their season and I love them. 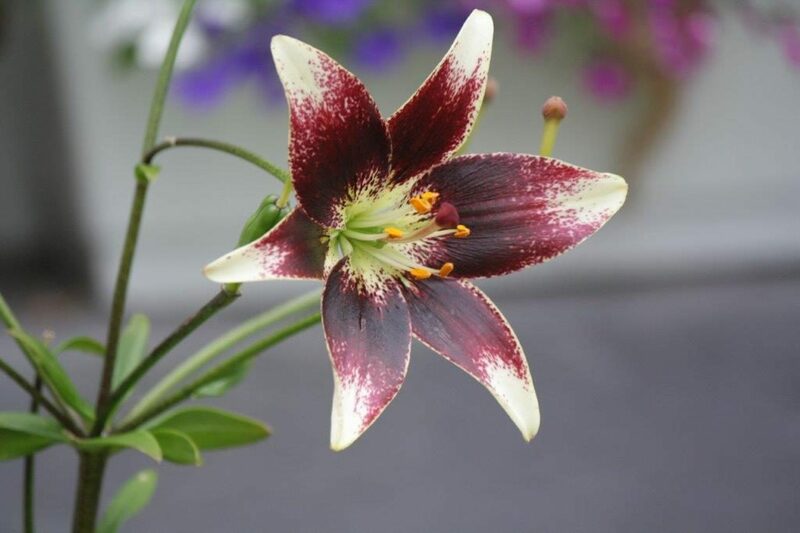 It brings such joy to see their dark petals with cream tips. I wish I could remember the name but I deleted the order from my email and I forgot to write it down. If I find out I’ll come back and update here. I’m happy with how these are spreading from year to year. They seem happy in both containers and the ground with the smaller bulbs flowering much earlier than I thought they would. They have a beautiful scent and although I bought them for either side fo my front door I moved them to the back patio so I can enjoy them more. The front of my cottage still looks like no one lives here lol. And that’s my six for this week. If you liked this post why not share it so others can enjoy it too? Finally, a huge thank you to all who popped over to Patreon and support the blog and podcast. It means the world to me that I can focus on growing the blog and podcast in a way that we all can enjoy. Want to support and Blog or Podcast? You can with a Ko-Fi or join the community on Patreon! If you liked this post why not share with others by clicking the share buttons below!! 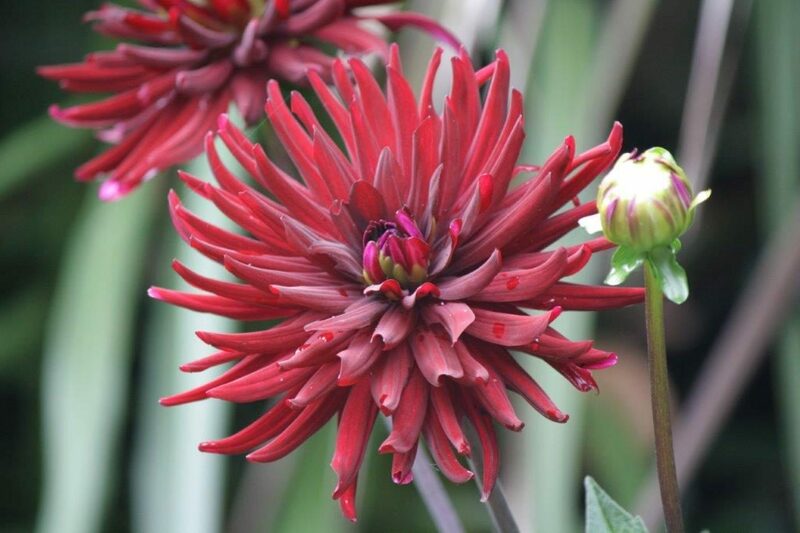 I have a thing for dark red Dahlias and the one in your last picture is stunning. How can you not love Fuchsias? Love;y pictures and I am jealous of your rain! we waited a long time for that rain! Agree w/Mala re: buddleia. Deadhead them as you go, then cut them down in spring. I inherited an older one that’d grown in the middle of impossible, so dug it up & moved it in the spring. It didn’t blink an eye, or wouldn’t’ve if it had one. As you say, no tap root. To be safe, you could save one of the babies (I think they self seed, not sucker) in case the old fella dies. Love the colours in your garden. Wish we could share the smells. One day Lora we will be able too. There is a plan to remove it; as it is so big, the space it vacates needs to be filled as it screens us from a public street. Great pictures! 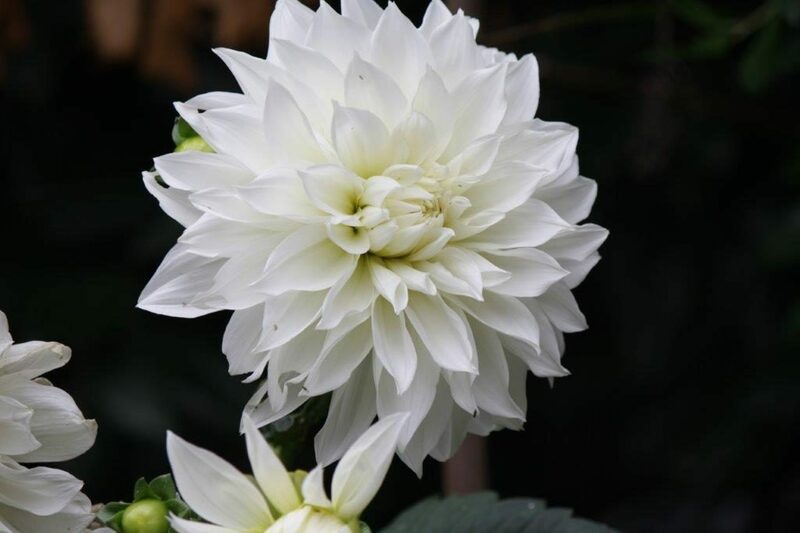 Do you know the name of this white dahlia? I don’t have whites and it seems particularly beautiful! 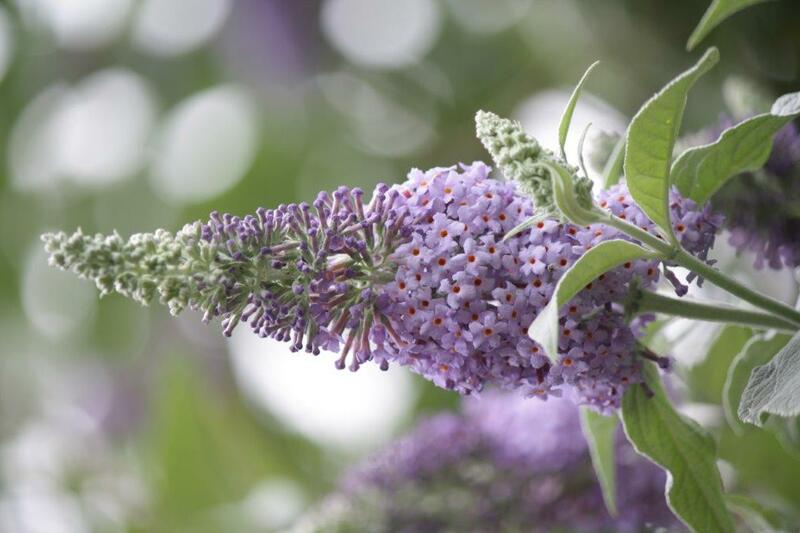 I chop the buddleia right back each spring and deadhead to encourage a second flush of flowers and to help minimise self seeding (which is how it spreads). We get very few butterflies on ours for some reason. Didn’t know about the lack of a tap root. That’s useful to know. I can almost smell those sweetpeas! I cut back my buddleia to about a foot in the spring to keep it in bounds. Deadheading keeps the flowers coming.